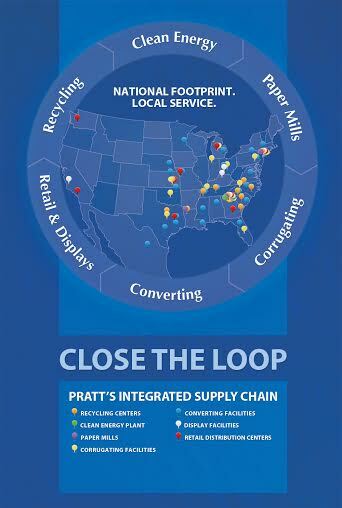 The Pratt Recycling team actively works with customers of Pratt’s corrugators, sheet plants, as well as Pratt Displays and Pratt Retail Specialties, to recover recyclables from their operations. 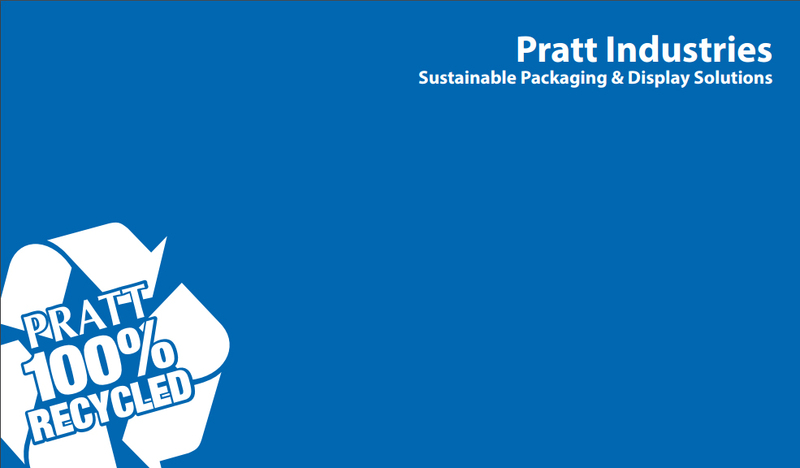 The concept is that Pratt sells the boxes to the customer and subsequently takes back material that may have been going into the waste stream. Pratt’s recycling division then separates the paper-based material from the non-paper-based material, and all of the paper is then sent to one of our paper mills which is used to make new linerboard and medium. This brings the process full circle and helps supply our Pratt’s 100% recycled paper mills with fiber. We call this “close-the-loop”. The process begins by sending a team member from the Pratt Recycling to complete a “waste assessment,” which evaluates what the customer is currently doing in terms of recycling in their operation. We look at what materials are being recovered, how they are being recovered, and if there are any other materials that we can divert from going to a landfill, therefore adding value to their total revenue from the waste stream. The customer is given a recap of their current program and our recommendations of how their waste and recycling program can benefit from some different ideas we present to the vendor. The outcome usually results in less material going to a landfill and more material being recycled. Therefore, the customer usually benefits from a cost savings due to lower trash hauling and landfill bills and potentially increased revenue from the value of the recyclables. So how are we doing? Currently we have well over 300 box customers that utilize the services of Pratt Recycling to handle their recycling program. This year, we went into a box customer that is buying over $1 million in converted packaging from Pratt. During the waste assessment we found that this box customer was sending nearly 70 tons of trash each month to the landfill; of which 30 – 40 tons were valuable recyclables. We were able to install a baler in the facility, and they are now recovering over 50% of what was being sent to the landfill…..and they are now getting paid for this material. The trash hauling and landfill savings alone is approximately $50,000 annually; not to mention the $15,000 to $20,000 of incremental revenue they are getting for the baled recyclable material. This is but one example out of the nearly 100 new box customers that the recycling division will open as recycling customers in 2013. The value we can bring to a box customer depends on a myriad of factors. Volume of the material and freight to the end user are the biggest factors in evaluating the value we bring in our proposal. Our role in the Recycling Division is to bring a service to the box sales team that can differentiate us from other corrugated manufacturers, ultimately creating a competitive barrier. If you feel that one of your customers or prospects can benefit from this service, please contact Pratt Recycling and select “I’m interested in recycling” from the recycling reason drop down.